Tajarin (pronounced <tie-yah-REEN>) is the Piemontese version of tagliatelle. Unlike other types of egg pasta, these thin, golden strands are made with a higher proportion of egg yolks, resulting in a delicate texture and rich flavor. Tajarin were first served in Piemonte as early as the 1500s, often with a hearty ragù of organ meats, poultry, or rabbit reflecting the typical la cucina povera. 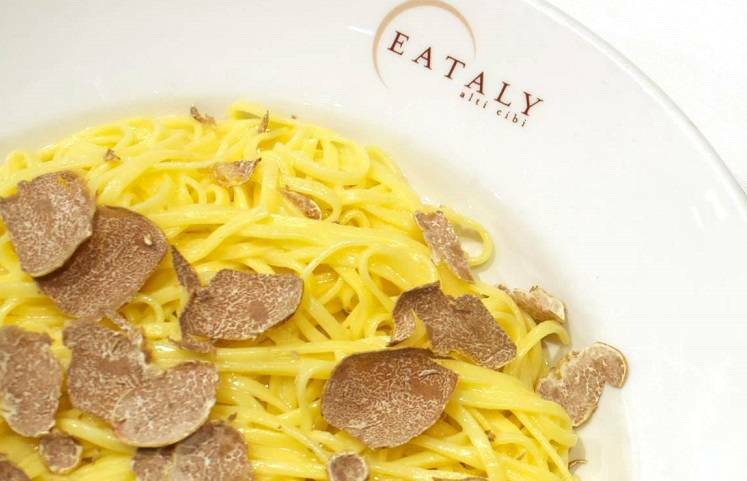 Despite the pasta's humble origins, nowadays it is served with a simple, yet luxurious butter sauce and shavings of fresh white truffles of Alba. On a large, clean work surface, add flour and form a well with your fingers. Add salt, eggs, and a few drops of oil to the middle of the well. Using your fingertips, gently mix together until a compact dough begins to the form. Knead until smooth and elastic, about 10 minutes. Form dough into small bread roll sized pieces. Cover in plastic wrap and leave to rest at room temperature for at least an hour. Using a rolling pin, roll out the pieces of dough into thin, flat rectangles. Leave to rest for a few minutes. Alternatively, you can roll out dough using a hand-cranked pasta machine. Cut the dough into 4 equal pieces. Keeping the dough lightly floured, roll each piece through a pasta machine at progressively narrower settings into sheets that are 5 inches wide (or as wide as your machine allows) and at least 20 inches long. Cut each strip crosswise in three shorter rectangles, each about 7 inches long. Flour each rectangle and roll them up the long way into a loose cylinder, like a fat cigar. With a sharp knife, cut cleanly through the rolled dough crosswise at 1/8- to ¼ -inch intervals. Shake and unroll the cut pieces, opening them into tajarin ribbons, each about 7 inches long and ¼ inch wide. Dust them liberally with flour and set them aside on a floured towel or tray. In a large pot, bring 6 quarts of water to a boil, and season it with salt until it is as salty as the sea. Place the tajarin in the boiling water and cook them until they are al dente, about 1-2 minutes. Meanwhile, heat the butter and ½ cup of pasta water in a large sauté pan over medium heat. Melt the butter and swirl the pan until the mixture looks creamy and becomes an emulsified sauce. Season it with salt to taste. Drain the pasta and add it to the pan with the butter sauce, tossing to evenly coat it with the sauce. If necessary, add some of the pasta cooking water to the sauce to keep it from getting too dense. Divide the pasta equally among heated bowls and serve immediately with shaved fresh truffles. Pair with Dolcetto d'Alba wine.